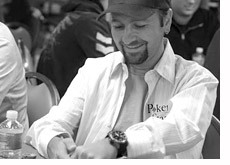 Daniel Negreanu is starting to quite enjoy the "High Stakes Showdown" on Pokerstars. And why not .. he has won the entire event two out of the three times that he has played it. For those that don't know, the High Stakes Showdown on Pokerstars is a $10k buy-in, Heads-Up tournament. In today's High Stakes Showdown, there were a total of eight players. Some of the names in the event included Daniel "Kidpoker" Negreanu, Chris "Genius28" Lee and Isaac "philivey2654" Haxton. Haxton and Negreanu ended up squaring off in the finals of the event, with Negreanu taking Haxton down. For his troubles, Negreanu received $50k for the victory while Haxton received $30k. The rest of the players didn't receive anything. While Negreanu's two victories in this event is impressive, it is nowhere near to as impressive as Sorel Mizzi's success in this tournament. I believe that Mizzi has won the "High Stakes Showdown" six or seven times. Hopefully Negreanu will play in more of these events, as they always fill up when he is playing. I believe the event was cancelled last weekend due to lack of interest, and this weekend there were a total of eight players.